Pennsylvania, like many of its neighboring states in on the east side of the US, has a fair amount of placer gold that was left behind from glacial drifts thousands of years ago. While you are unlikely to find quantities that are sizable enough to get rich, there is certainly enough to interest the recreational prospector. There is a thriving mining industry in the Pennsylvania, mainly for coal and iron. Several of the large iron mines in the southeast part of the state have produced several thousand ounces of gold as a byproduct. Mines near the towns of Cornwall and Morgantown are worth investigation, since any lode gold production generally means that placer deposits can be found in nearby creeks and rivers. The better known placer mining locations in Pennsylvania are in York and Lancaster Counties, but all counties in the state have potential for some minimal gold occurrences. In York County, check the areas around Dillsburg, Grantham, Wellsville, and Rossville. Most streams in this area will produce at least small amounts of placer gold if you search in the right places. Further south near the towns of Shrewsbury and Winterstown, stream also produce some fine gold. To the east in Lancaster County near the town of Quarryville, check out the Susquehanna River and Peter’s Creek. Both will produce some gold, and even small platinum nuggets have been found here. Wyoming County in the northeast part of the state also has placers in several creeks. Most of the gold in the northern parts of Pennsylvania was brought down by glaciers, and left behind during a series of ice ages over millions of years. This gold originated from rich deposits in Quebec and Ontario, which became scattered across the eastern United States. As is typical of this sort of deposit, the gold is often widespread, and locating rich gravels to work can be difficult. Don’t get to focused on a specific area, be sure to explore different locations and evaluate new areas to increase your odds of finding the richer gravels. 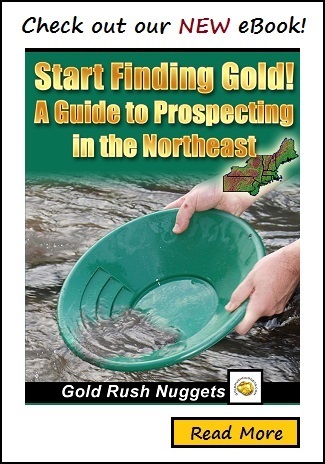 Want to learn more about gold prospecting in the Northeast? Then check out our new eBook!